Poor Evo Morales. 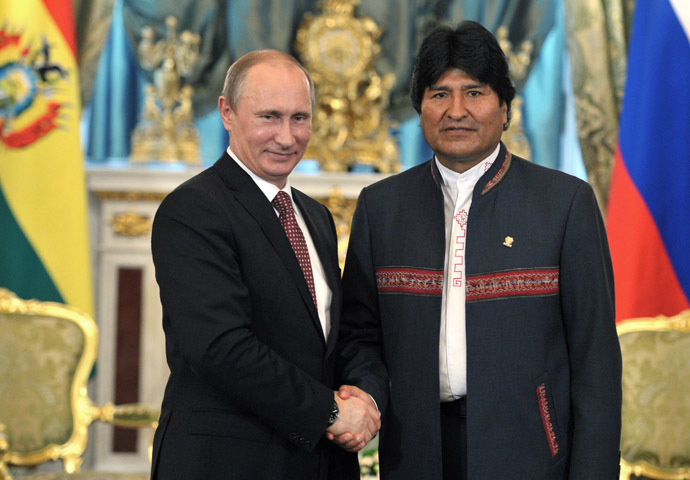 The leftist Bolivian president was in Moscow on Monday and Tuesday for the Gas Exporting Countries Forum, and must have been feeling quite important indeed. His country has the second-biggest gas reserves in South America after Venezuela—not to mention half of the world’s lithium, which powers your Prius—and here he was, on the international stage, being considered a member of a motley crew of thorny leaders: Russia’s Vladimir Putin, Iran’s Mahmoud Ahmadinejad, and Venezuela’s Nicolás Maduro. No doubt these men shared notes, and laughs, over their needling of America. Putin has been on an anti-American tear since last year’s presidential campaign, and in December signed a law banning U.S. families from adopting Russian children. Ahmadinejad thinks the U.S. is “a satanic power.” Maduro has called President Barack Obama the “grand chief of devils.” Morales, meanwhile, has expelled the American ambassador, the Drug Enforcement Agency, and the U.S. Agency for International Development (U.S.A.I.D.) from his country. So he must have been thrilled when RT, Russia’s English-language outlet, asked him whether he would consider granting asylum to NSA leaker Edward Snowden. Here was a chance to weigh in on the international story of the moment, and at the same time further his anti-American bona fides. Oops. Morales had come to Moscow for a photo op, and now he’d inserted himself in the middle of an international diplomatic crisis. He probably didn’t realize as much, though, until his plane home to La Paz was rerouted midair after France, Portugal, and Spain allegedly refused to let the plane into their airspace because of suspicions that Snowden was on board. “Low on fuel, the plane’s crew won permission to land in Vienna,” the New York Times reported. That verb, “won,” stings—as if Morales’s plane were involved in some kind of life-or-death sweepstakes, a loss meaning that the plane, its last drop of fuel consumed, had crashed somewhere in the Mediterranean Sea. Morales must have had plenty of time to think while being, as he described it, “held hostage” at the airport—and he has yet more time now, his plane since departed and currently flying over the Atlantic. Staring out the window at the horizon, he must be thinking about the U.S. Empire, and whether its great reach was responsible for his unscheduled layover. He also must be thinking a lot about that interview with RT, and whether he should have waded into the Snowden saga in the first place. But more than anything, the Old Continent now safely behind him, the president of the Plurinational State of Bolivia must be thinking about how he's not nearly as important as he felt just 24 hours ago.